Red Swing Dress is rated 3.8 out of 5 by 4. 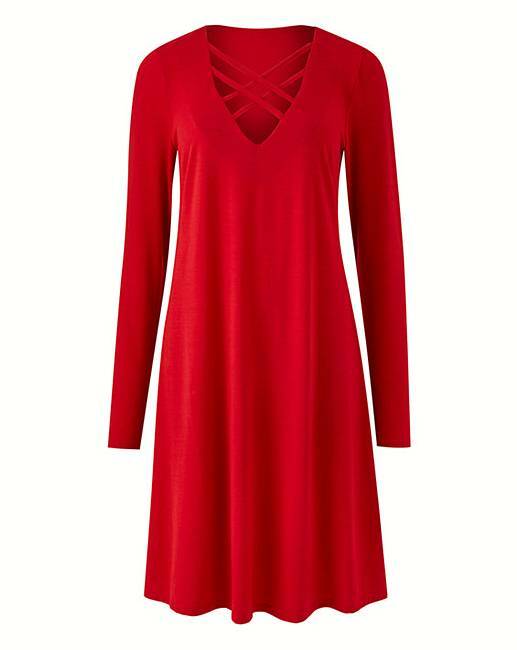 Bold and beautiful, this striking red dress is guaranteed to turn heads! In an easy-to-wear swing shape, this is the must-have of the season. Made from a soft jersey fabric, the dress features cross strap detail at the neckline, to create a more feminine look. Wear all day long with your casual knee-high boots or team with tights and a statement boot. Rated 5 out of 5 by Sonny from Lovely dress This is a lovely dress. The material is a bit thicker and washes well. I wear this dress over black trousers and have received many complements. I also purchased the leopard print version. Rated 3 out of 5 by jobeau from Not Enough Swing! Ordered this dress because of the colour and the 'swing' fit which is usually flattering on my frame but the red just wasn't the vibrant red in the picture and there was NO swing. It fitted my frame too closely and simply needed more material to be called a swing style. Nice soft fabric.